The magnet assembly has been disassembled for any reason. This calibration procedure applies to computer software version U406 and above. This includes production models build after mid-September, 2009. Learn how to check your software version, and your manufacture date. To check your software version, remove the batteries for 20 seconds, then reinstall the batteries. Observe the computer display during start-up and look for “U###”. 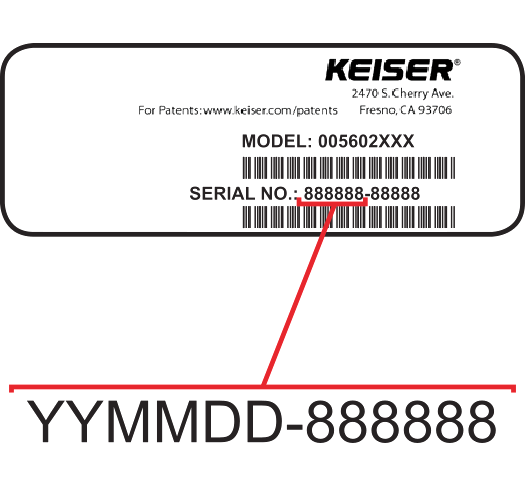 To find your manufacture date, check the date code in your product's serial number. 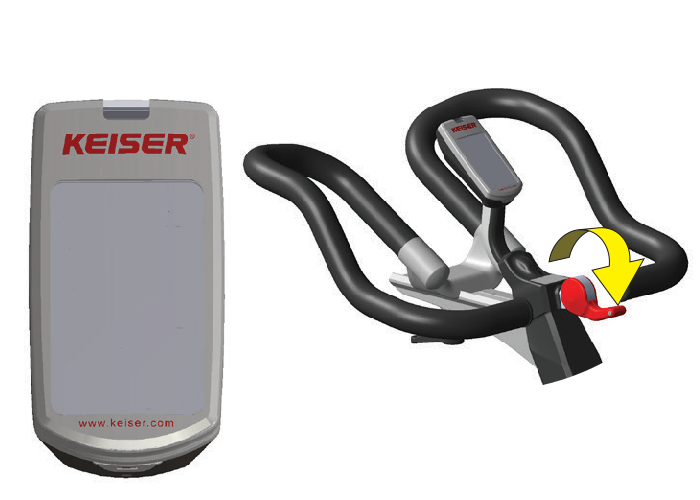 This process requires a special tool, supplied by Keiser (Red Calibration Tool, PN 555089). The following steps must be completed within 30 seconds. After 30 seconds, the computer will exit calibration mode and must be allowed to sleep before attempting calibration again. 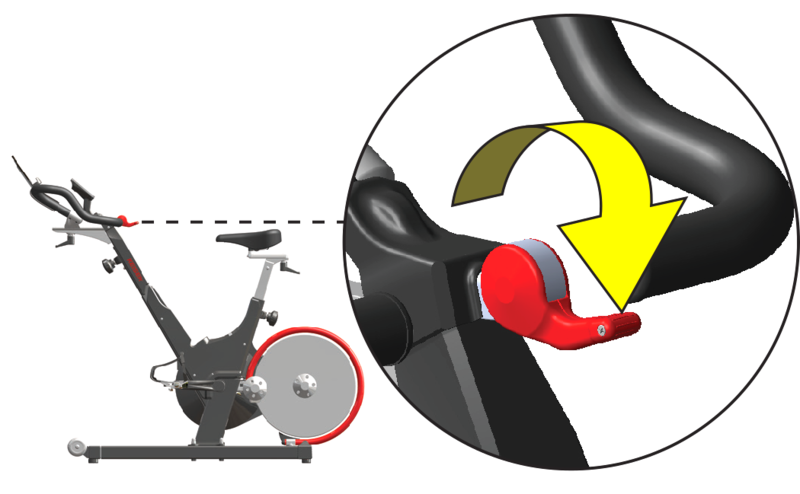 Place the Cycle on a flat, level surface with clear access to the left side. Set the Resistance Lever to the lowest position. Please read all instructions carefully.. Make sure you've read, and understand, all the instructions above prior to beginning the calibration procedure below. STEP 3 through STEP 6 must be completed within 30 seconds. Begin with the Computer off. Then, push the Resistance Lever to the lowest position. 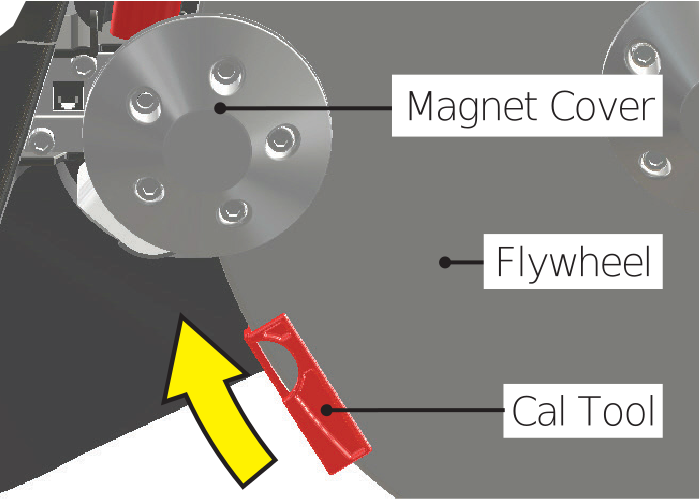 Place the Cal Tool onto the Flywheel as shown above. Slide the Cal Tool up until the Cal Tool comes to a hard stop beneath the magnet holder. 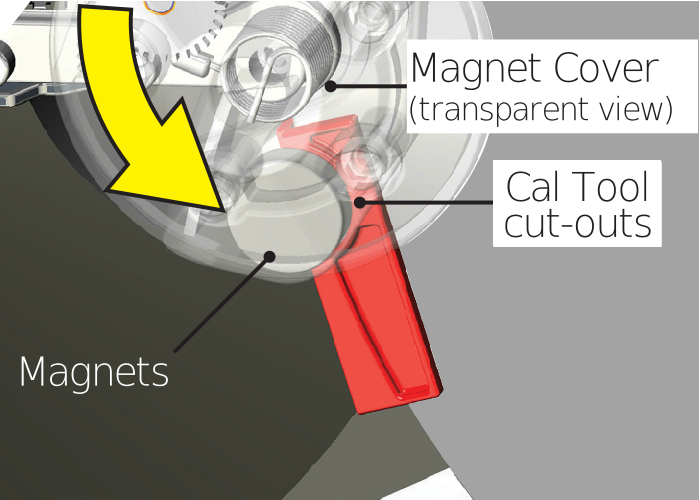 Turn the Magnet Cover counter-clocwise until the Magnets stop against the cutouts in the Cal Tool. Release the Magnet Cover and allow it to return to its rest position. Remove Cal Tool (it is no longer needed). Move the Resistance Lever from stop to stop 6 times. 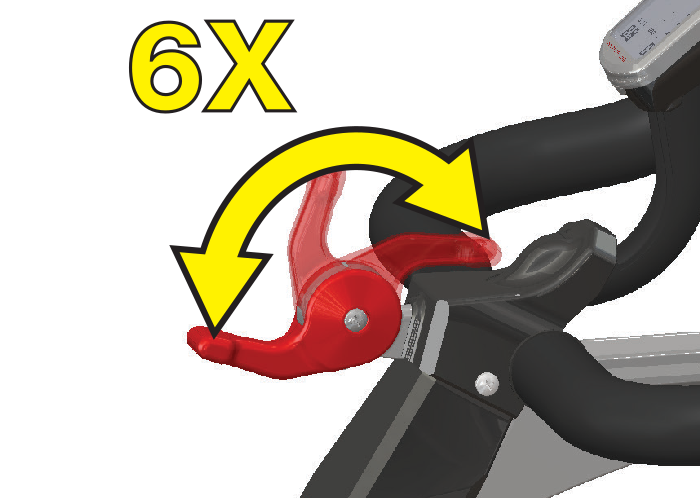 Make sure the Resistance Lever makes the complete travel from stop to stop all six times. Failure to do so may force an error. “CAL’b” will display upon successful completion of the Calibration procedure. (NOTE: Diagnostic values above the “CAL’b” row will vary). Allow the computer to sleep before use. If an error symbol “Err#” appears on the display, allow the computer to enter sleep mode, then begin the calibration procedure again from STEP 1. 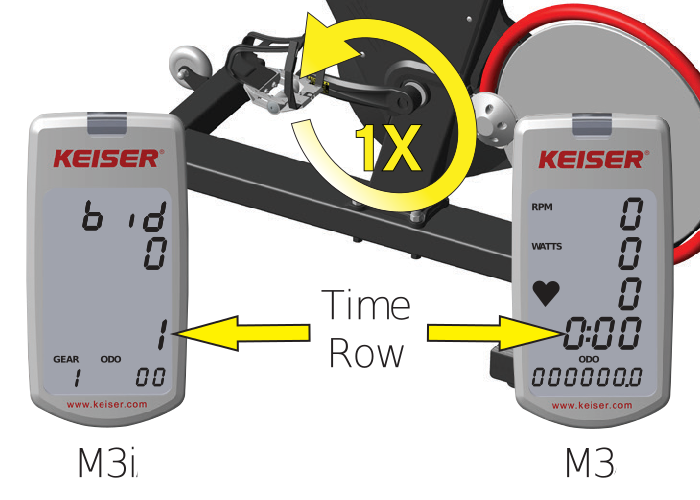 If the error persists, note the error number and diagnostic values and contact Keiser Customer Support. 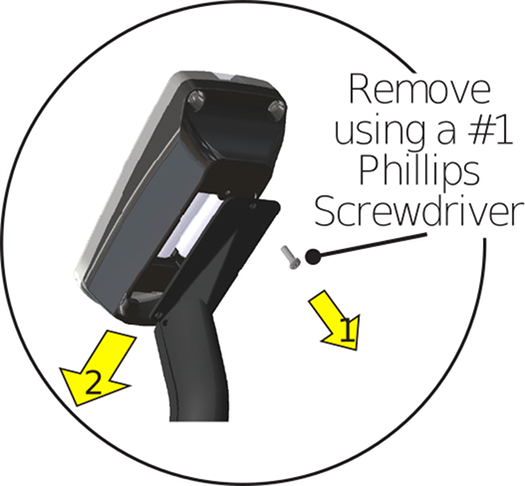 For your convenience we offer a step-by-step guide and a video demonstration. 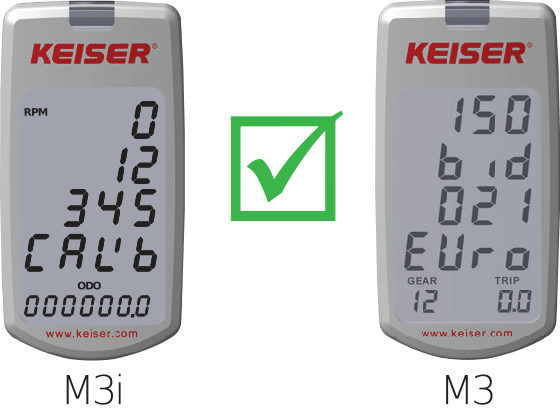 For support with your M3i calibration call 1-888-555-1212 or send us a service request.